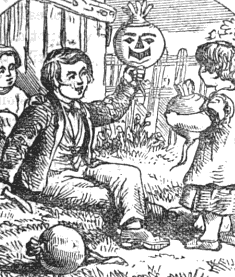 A children's book (The Dew-Drop, excerpt below) gave detailed instructions for its "puzzled" readers in 1873 who knew about 'dipping for apples' and dressing with masks as "Guisers" but not "turnip lanterns." 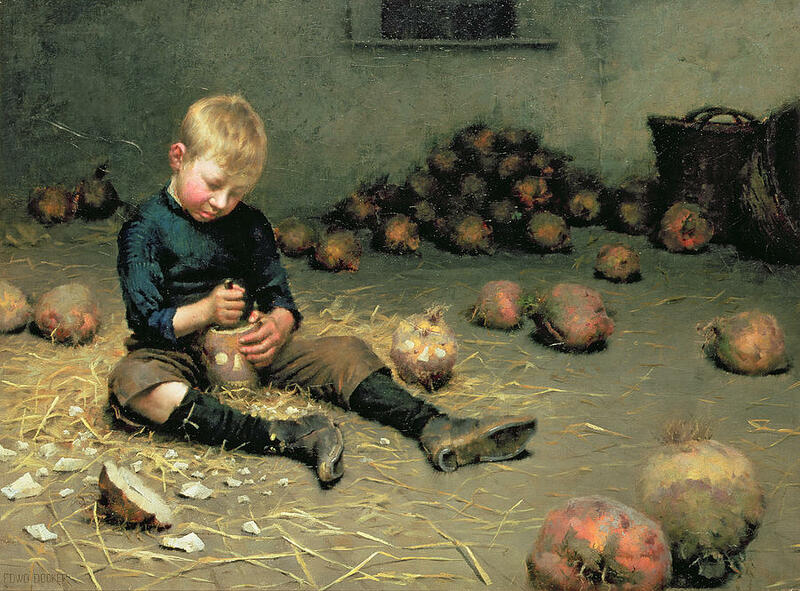 Find a large turnip ("lanterns which I stole never turned out a success") and scrape out with a pocket knife. The rind or skin must not be punctured - that must be tough with the thin skinned turnip - or the wind would blow out the candle. "The light portions of the face will shine out against the darker and thicker parts of the skin." Make a hole in the lid for the smoke and cut out the bottom to place over a candle. 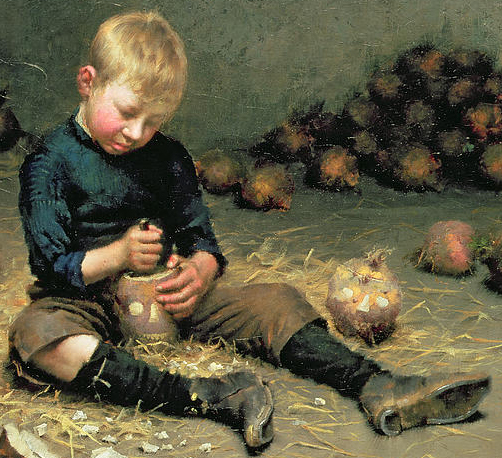 "The Turnip Lantern," 1838 by William Henry Hunt (1790-1864) is in the New Walk Museum & Art Gallery, Leicester UK. 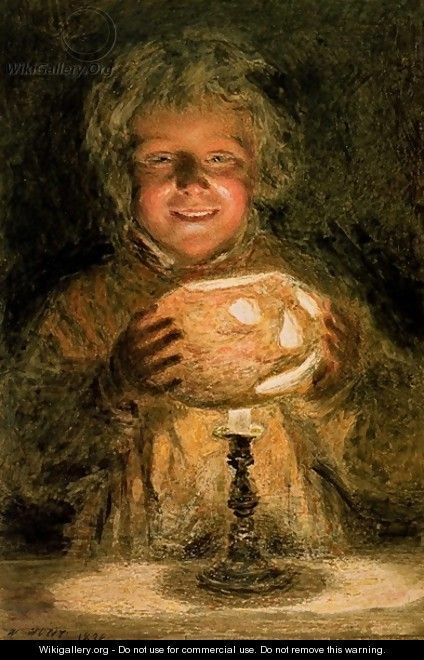 The painting "Making Lanterns" c1880-1899 by Edward Docker (1858-1932) is now in a private collection but this copy, from fineartamerica.com, may be clicked to enlarge. 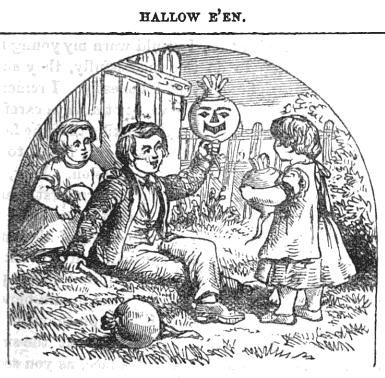 Past Halloween posts include a favorite oddity - Snap-apple Night - Trying to bite into an apple. arms behind back. on a string. revolving. with candles. what could go wrong?? HALLOW E'EN. DEAR YOUNG READERS,—I would not be astonished if some of you are a little puzzled at the wood-cut before us. A little explanation will perhaps clear the matter up. Now what do you think the biggest of these three little folk is holding up in his hand? It is a "turnip lantern." What, you say, a lantern made out of a turnip! Yes, my dear reader, and this is not at all an uncommon thing in country districts. I would warn my young folks that as a first step to do this successfully, they should procure a turnip righteously and honestly. 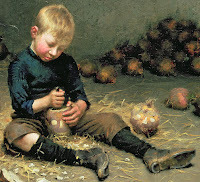 I remember when I was a little fellow, I was not always careful in procuring my turnip honestly, but thinking that the farmer would surely never miss one out of so many, I used to take the turnip, and that without any permission. Somehow my lanterns which I stole never turned out a success. 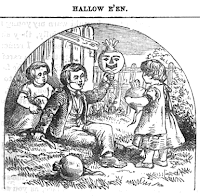 Now, dear reader, if you want to make a turnip lantern, first, procure as large a turnip as possible, and then proceed with your pocket knife to scrape out all the substance of the turnip, leaving only the rind or skin. You will find this takes no small pains and patience, care being required not to penetrate the rind, as this would let the wind in and blow out the candle. Having scraped all the substance out of your turnip, and made a hole in the lid to let out the smoke, proceed to cut on the outside a man's face, as you see has been done by the little fellow in our picture. Do not cut the shell of the turnip quite through but cut as thin as possible, so that as much light and as little wind may get through as possible. Thus the light portions of the face will shine out against the darker and thicker parts of skin. You must make a hole in the bottom of the lantern to receive the candle. When this is lighted all is complete, and you may now call on some of your friends and show your lantern. Let this, of course, be done at night, and on as dark and quiet a night as possible. But what I consider the crowning success of a "turnip lantern” is, to place it some dark night on the top of a pillar of snow. It is then that your man's face will show to advantage, and doubtless not a little astonish any who may happen to pass by.